Police investigating alleged abuse at a Jersey children's home say they have found blood-stained items in two secret underground chambers. The discoveries were made at Haut de la Garenne, the former children's home where 100 people say they were abused. Officers were searching the last of four cellars referred to as "punishment rooms" by people who claim they were physically and sexually abused. Police say a skull fragment found in February probably pre-dates 1940. However, they said their investigation remained a possible murder inquiry. Meanwhile, Deputy Police Chief Lenny Harper said it was not clear at this stage whether there was an innocent explanation for the bloodied items, details of which have not been released. 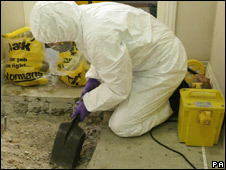 He said: "In the last few days in cellars three and four we've found a number of blood-stained items. "I would hesitate to assign a sinister motive to those, we just don't know, there may possibly be an innocent explanation for them. "But the fact remains that, with the dogs' assistance and the good work of the forensic examiners, we are still finding items which are of possible significance to the inquiry so it must go on." A major child abuse investigation is under way at Haut de la Garenne. Scores of people have alleged that they were sexually and physically abused there as children. One person has been charged in connection with allegations of abuse at the former children's home. The home's former warder, Gordon Claude Wateridge, 76, has been charged with three offences of indecent assault on girls aged under 16 between 1969 and 1979. He has appeared before St Helier Magistrates' Court and was released on conditional bail until 12 May. However, there are believed to be more than 40 suspects in the overall inquiry.